Heading to work on Monday morning, I had my first Road Traffic Collision (RTC). It’s not really an experience I want to go through again! I’d left for work just before 7am as I normally do when I’m riding - this gives me plenty of time to get to work and then grab a shower before I start. I’d taken the Brompton as it had been a while since I’d ridden it. I left the house and headed off to work. 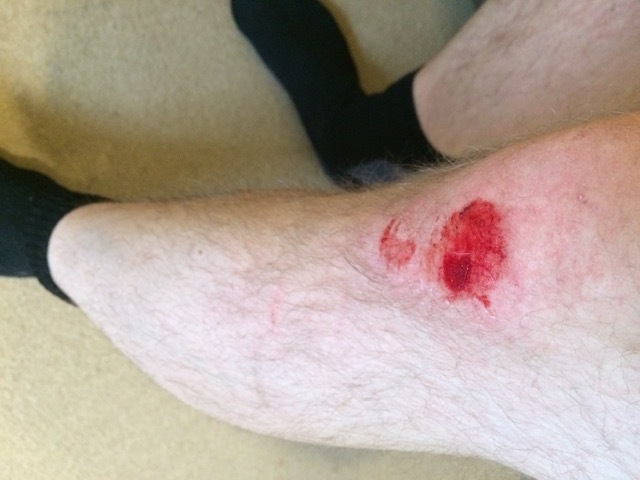 I hadn’t gone to far (in fact, I’d gone only two roundabouts, probably less than 5 minutes cycling) before I was knocked off my bike by a taxi! I was travelling straight across the roundabout to get cross the rounadabout so that I could join the cycle path on the other side of the road and head out of Welwyn. However, as I was travelling across, the taxi entered on to the roundabout from my left and hit me, knocking me off the bike. As I was travelling across his path, I could see that he wasn’t going to stop in time and for a split second I knew what was coming and I think I managed to get a cry out before he hit me. I went down and I recall being on my back and then turning over onto my front. The driver did give me his details and asked if we could sort it without the insurance company. I agreed at the time but I’ll do some follow up posts on how that goes! He offered me a lift home but as it was so close, I decided to walk. Getting home I was able to look at my injuries. 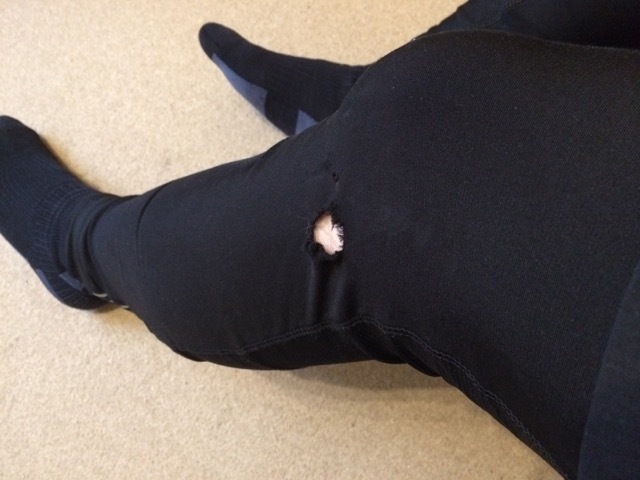 I’ve got a hole in my tights - so that would be a cost to replace those. I wasn’t sure if I hit my head so I’ve decided to replace my helmet in case. The Brompton also needs some work, so I’ve had to take this to St Albans Bicycles in St Albans to get it checked as they’re my nearest Brompton dealer and were recommended. I called the police on the 101 number whilst at home and was able to give a statement later in the day to the officer. Based on the description and details I’d got, the police would be able to get a statement from the driver (as I had his mobile number, registration details etc). However, it might just go down as an accident and nothing further might happen (which, I imagine is likely to be the case). I then went to the Minor Injuries Unit and got checked out by a nurse and then a doctor to ensure that I had no other injuries that weren’t visible. Turns out, a grazed knee was about the extent of my injuries, which I guess is extremely lucky. I also spoke to the CTC Accident Helpline, as a CTC member. However, having spoken to the lawyer, this is unlikely to go anywhere as it would be a personal injury claim, and if I’m better within 2-3 weeks, they wouldn’t proceed with a claim (I guess it wouldn’t pay them enough). I do, however, have the insurance details (including the policy numbers) of the driver - not that he gave them to me, as I’m hoping we can resolve the issue without calling them, but I was able to get this from the Motor Insurance Bureau, though the askMID website. If I need to, I’ll go down this route! Overall, at the minute, I’m slightly out of pocket, but short of a scraped knee, I’m actually feeling ok and I was extremely lucky - it could have been much worse than it was. I’ll update in the future as to how things go with getting some cash back! My concern is when he figures out how much a Brompton is to repair, I’ll be forced to go down the insurance route.